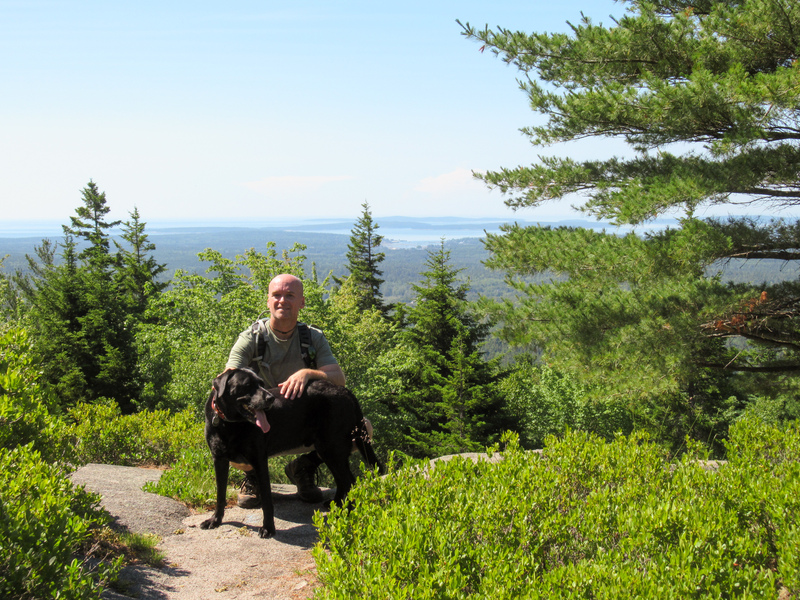 Almost all the hikes in Acadia are dog-friendly. 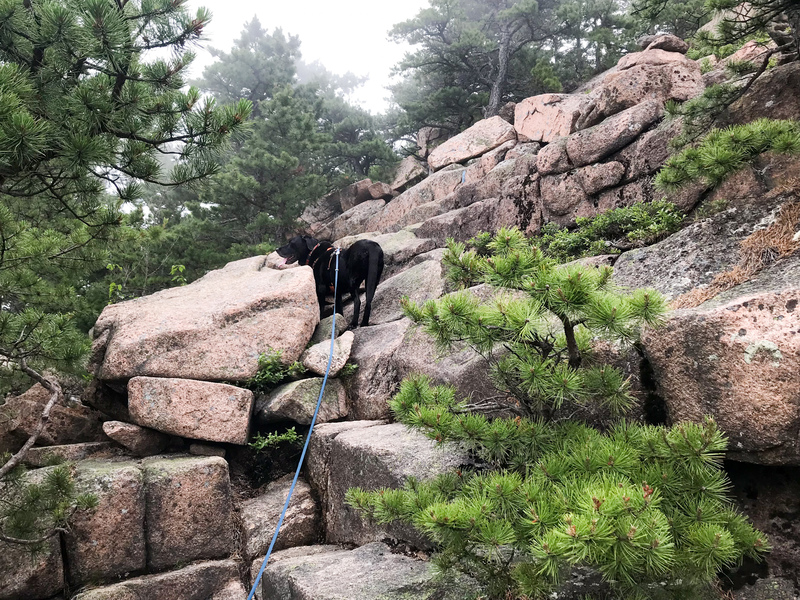 There are a few exceptions, mostly due to iron rungs/climbing and there are some trails that are not recommended because of rock scrambling and steep inclines; however if you have a flexible and active dog, those trails may be fine with a little human help from time to time. 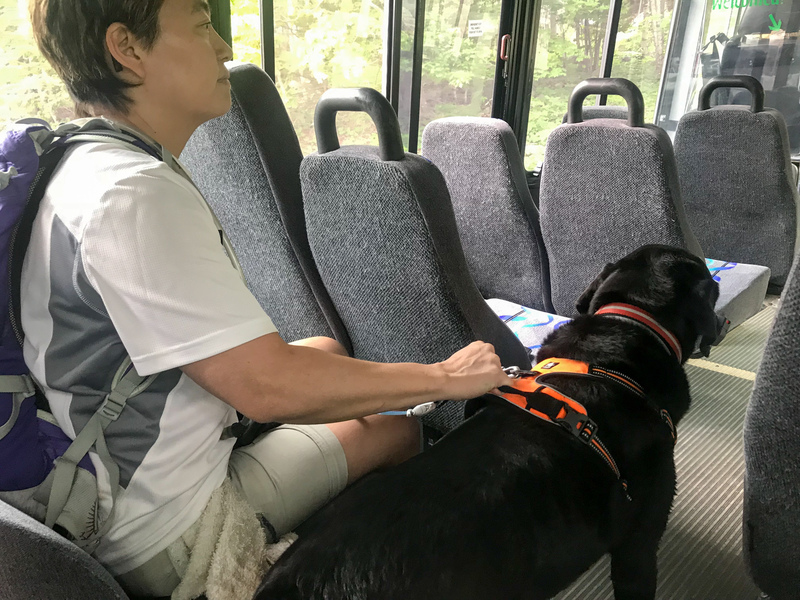 If you and your dog are interested in some of those hikes, definitely do some research before tackling them though. One popular “hike” regularly mentioned is the Precipice Trail which isn’t so much a hike but more like a climbing route with iron rungs, handrails, bridges, and ladders. It’s not meant for the faint of heart or those with height issues and I highly recommend watching some of the youtube videos to see the trail highlights before deciding. I was raring to go but unfortunately the Precipice Trail closes from March until August every year for peregrine falcon nesting so that was a non-starter. 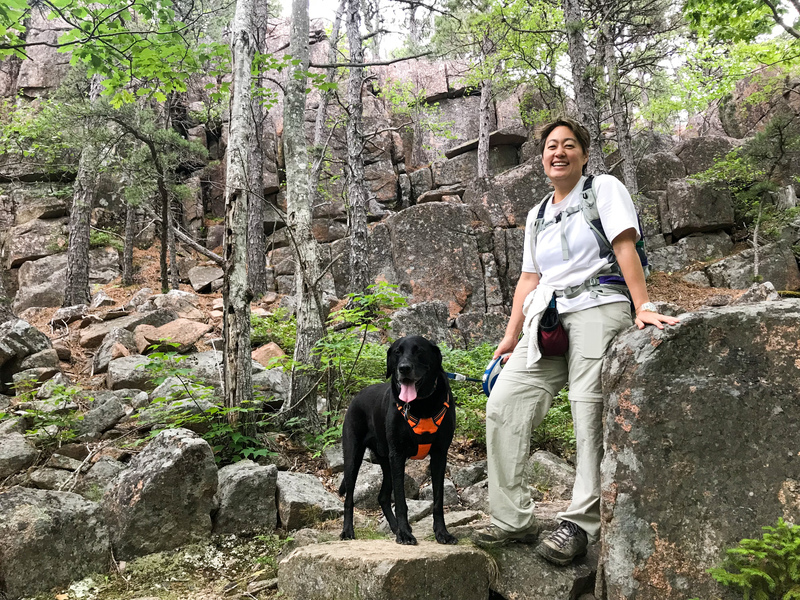 There is a different trail that reaches the the same Champlain summit as Precipice, that’s dog-friendly and open so we tackled that one instead. Our hike started at Seiur de Monts and ended at Sand Beach with an option to continue to Otter Cliffs. We prefer hiking early in the morning to avoid crowds, so we had no trouble finding a parking spot at Seiur de Monts. We took Wild Garden Path to Beechcroft Trail to the top of Champlain Mountain. Once at the top, we continued on Champlain South Ridge Route down to Sand Beach. 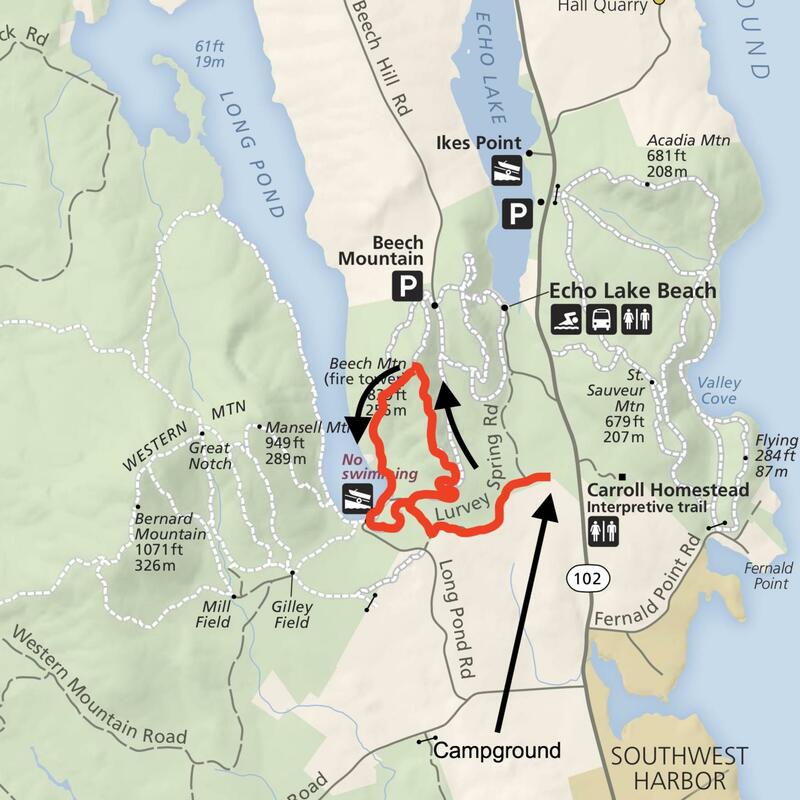 Since the hike is less than 4 miles, we planned to add Ocean Path Trail as it’s a popular and beautiful walk along the coast. Unfortunately by the time we made it to Sand Beach, the area was already crawling with tourists, so we aborted. 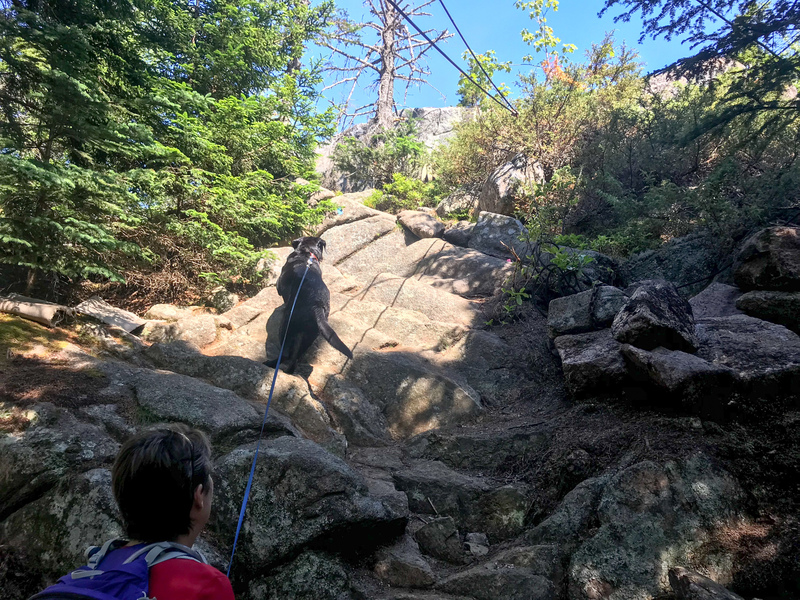 NPS does not recommend Upper Beechcroft Trail for pets due to the rock scrambling and scaling involved. Opie did great and only needed one or two boosts from us. The trails pass by small ponds, lakes, and rainwater puddles which made for a cool and happy dog. 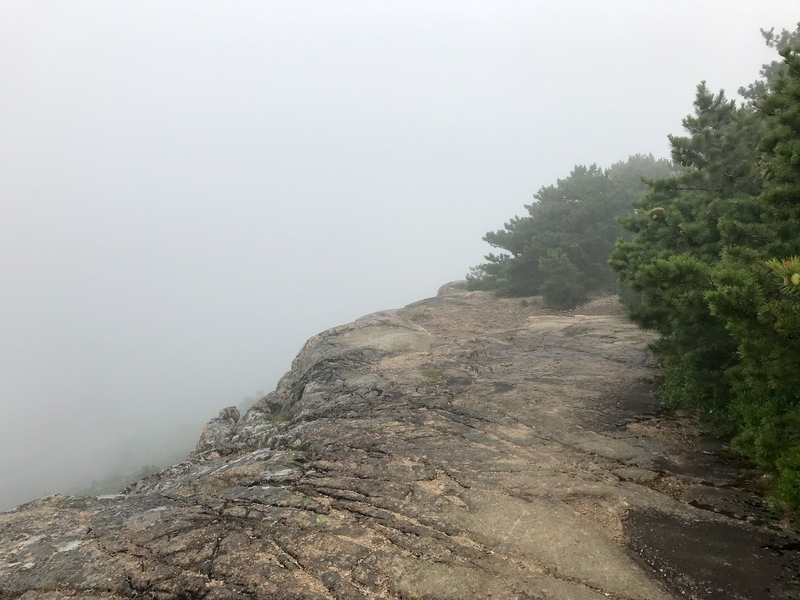 The views from the trails are gorgeous… ok, they would have been gorgeous if it wasn’t completely fogged in while we were hiking but using my imagination, I’m sure they were breathtaking. In actuality, the views were a little creepy since everything is completely shrouded in white as though there’s nothing else out there. It had a definite sci-fi/horror feel to it, this is what happens when one is “blessed” with a vivid imagination. 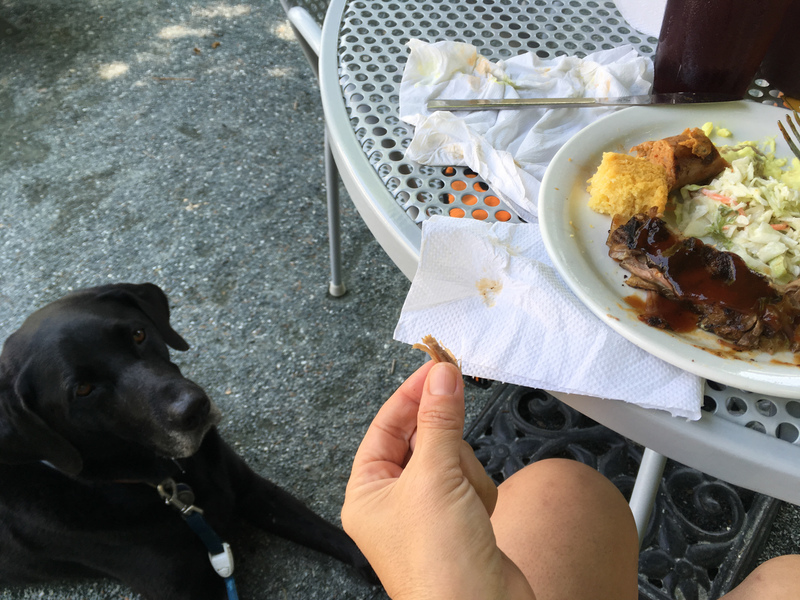 Once we reached the end of the hike we took the bus from Sand Beach back to our car and stopped at Mainely Meat BBQ for some much-needed energy replenishment. Opie was thrilled to find rain puddles at the top of the mountain. But the bus ride was not Opie’s cup of tea. 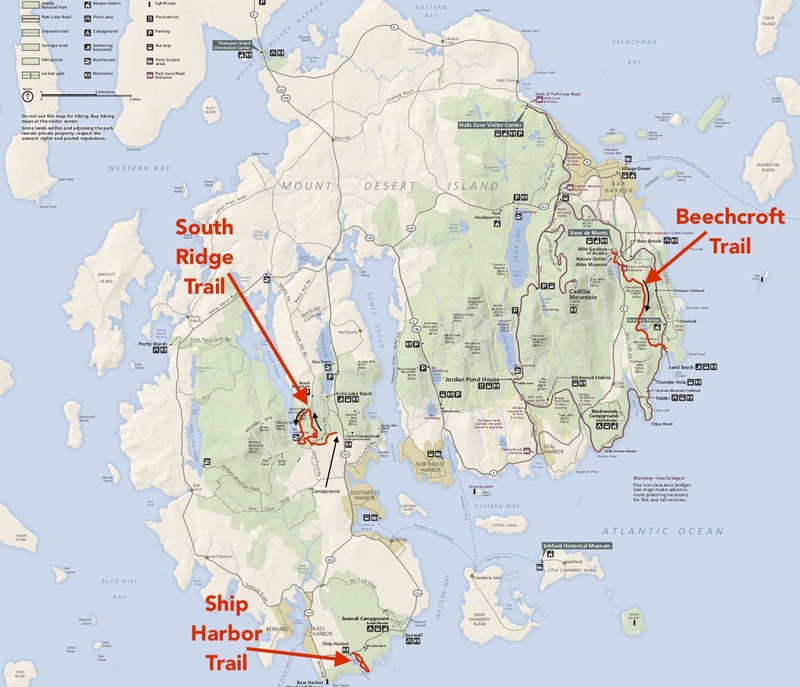 In Southwest Harbor there are some nice easy hikes and they tend to be less populated. Ship Harbor Trail located along the southern tip of MDI, near Bass Harbor had been recommended by WheelingIt so we took a quick drive to the trailhead. 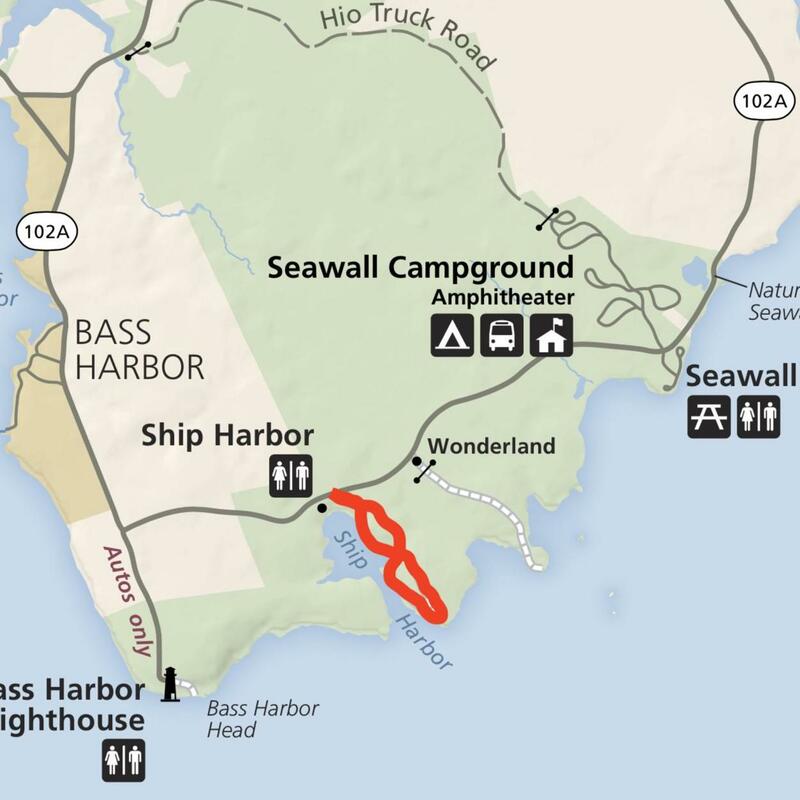 The trail forms a figure-8 and spends some time hugging the coast along Ship Harbor, hence the name of the trail. 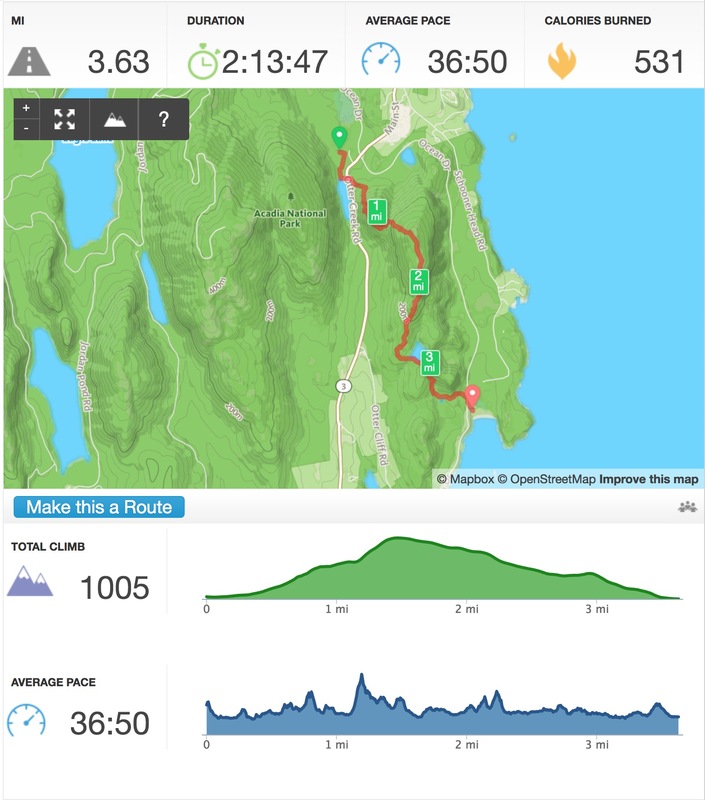 It’s a very easy mostly flat 1.7 mile walk/stroll with some nice views of the ocean, rocky coastline, forests, and the inlet. While the views are pretty, we much prefer higher elevation views and more challenging trails. This is a great stroll for families and a good spot for a picnic lunch. 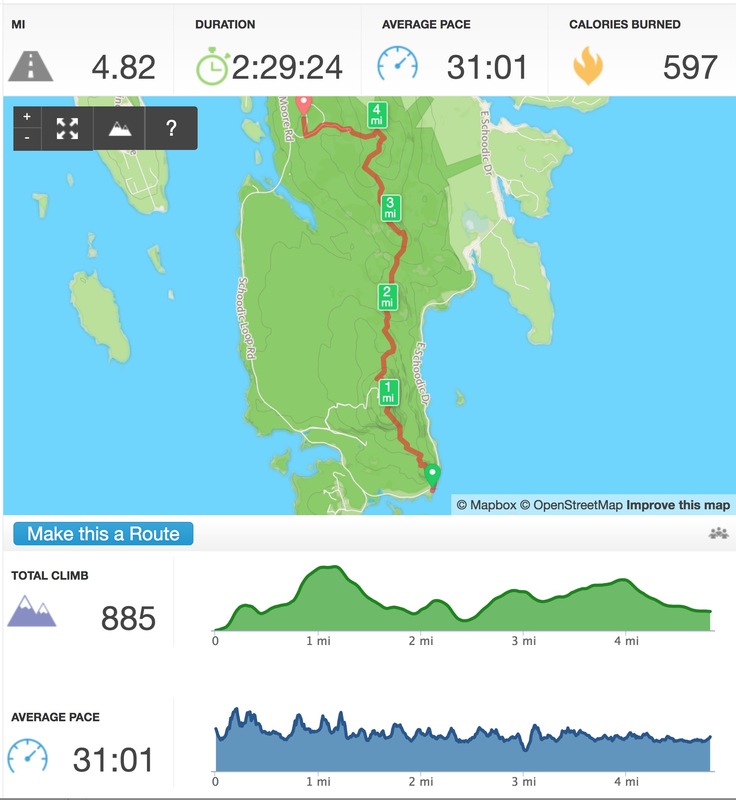 If you want to add a little more, there’s a nice easy hike right up the street, Wonderland Trail which is more through the forest and is also only about 1.5 miles. 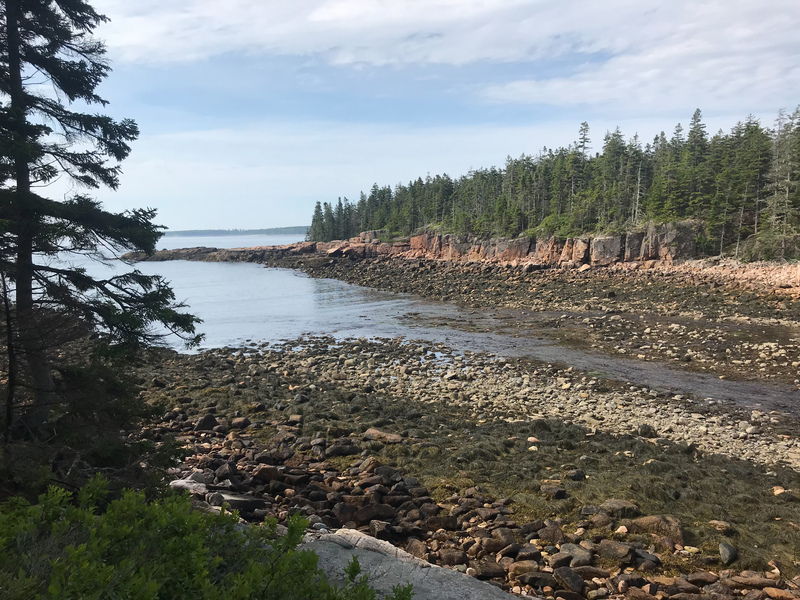 One of the great things about Smugglers Cove campground is the vicinity to Acadia NP and nearby trails. Lurvey Springs Rd is a gravel road (cars are allowed in the summer) that lead to multiple hiking trails and to Long Pond and Echo Pond. Unfortunately for Opie, both Long & Echo Ponds are used for local water supplies so no swimming is allowed. 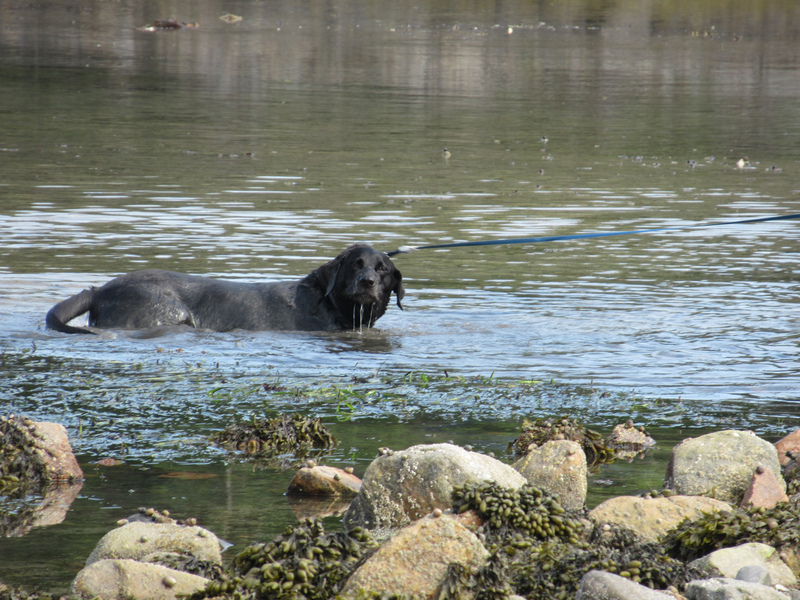 So while it was a pleasant 3 mile walk to Long Pond, it became an unpleasant tug-o-war with Opie to keep him out of the water and I’m sure he sulked the entire way home. From our campground, we could spot a fire tower on a nearby mountain. 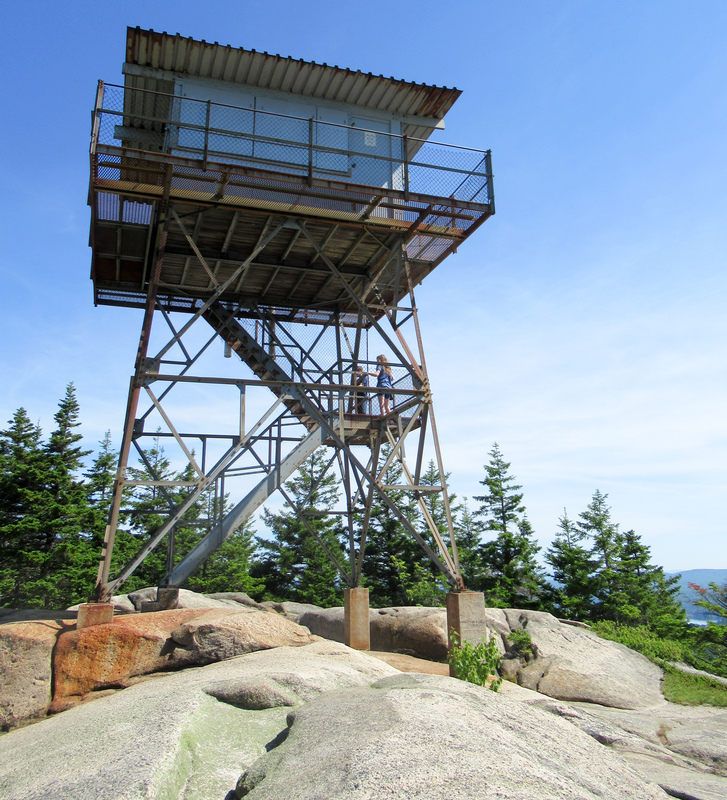 After some research, we discovered it was the iconic Beech Mountain fire watch tower and we could reach the tower from the campground instead of having to drive to the trailhead. From the campground, we walked onto Lurvey Springs Rd which meets with Valley Trail. We took Valley Trail to South Ridge trail to the top of Beech Mountain. 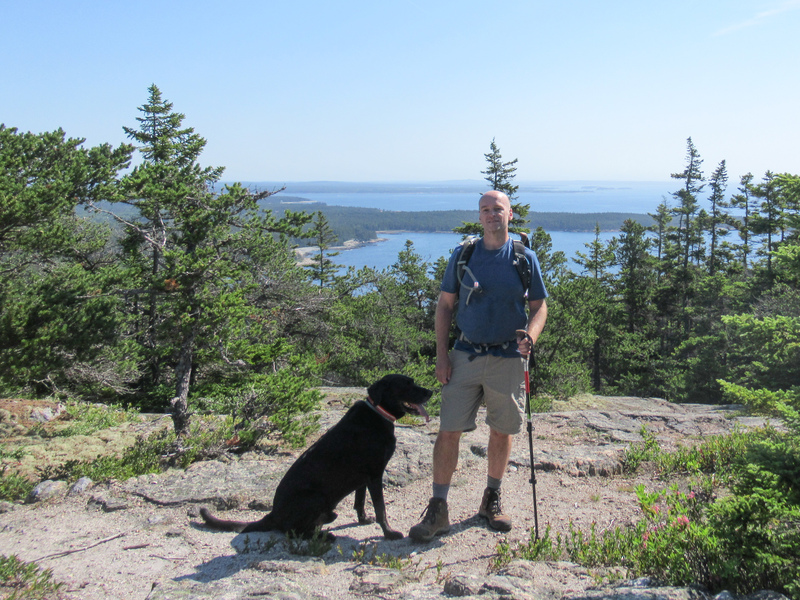 There are some fantastic views of Acadia and Southwest Harbor from the top of the mountain. The tower was closed so we could walk up to the first flight of stairs but no higher than that. We enjoyed the views, the quiet, and a granola bar split three ways before going back down on the West Ridge Trail for some nice views of Long Pond. West Ridge Trail is a bit tricky going down as there are no switchbacks and the descent is rocky and steep. 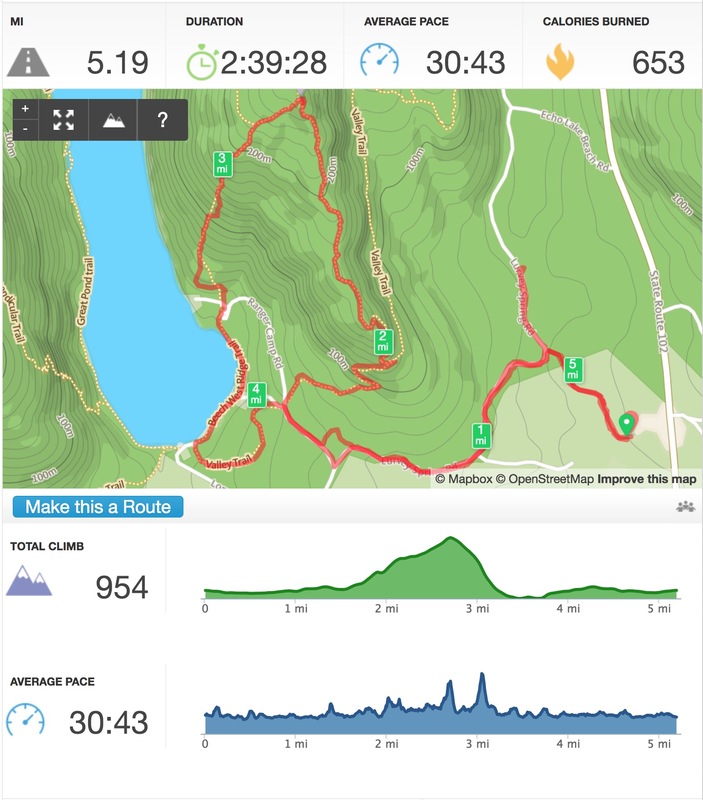 The whole hike is around 5 miles with a total climb of 1000 ft, I’d consider it a moderate hike with some tricky rocky areas. 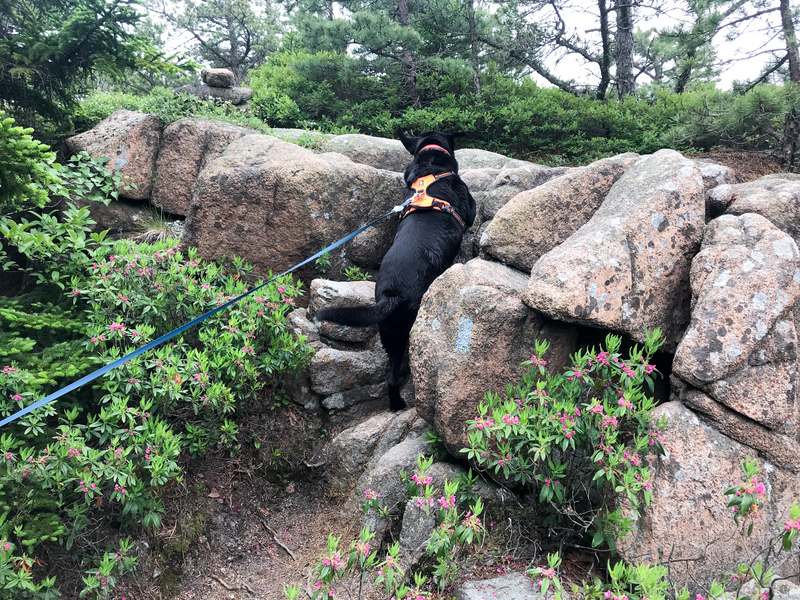 It’s dog-friendly but I’d say it’s geared more for an active dog that can handle steep rocky areas. Opie did just fine on this hike. An easier option is the Beech Mountain Loop. It’s an easy 1-mile loop that will take you to the fire tower from the parking lot right from Beech Hill Rd. 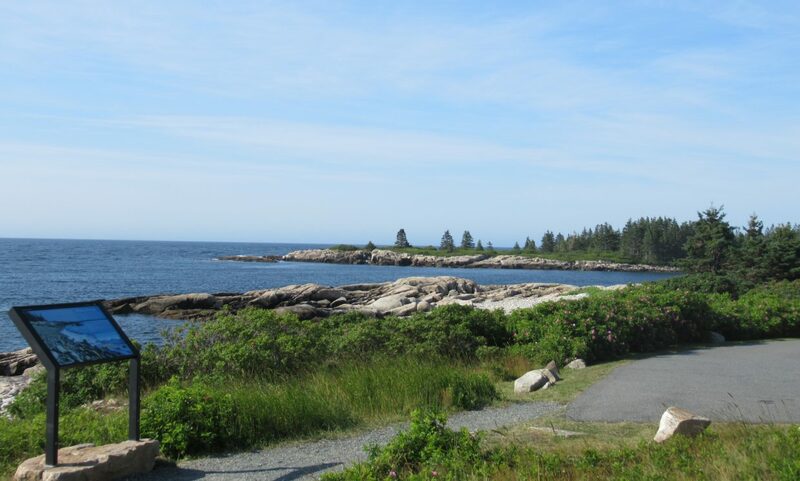 For the second half of our visit we camped on the Schoodic Peninsula. 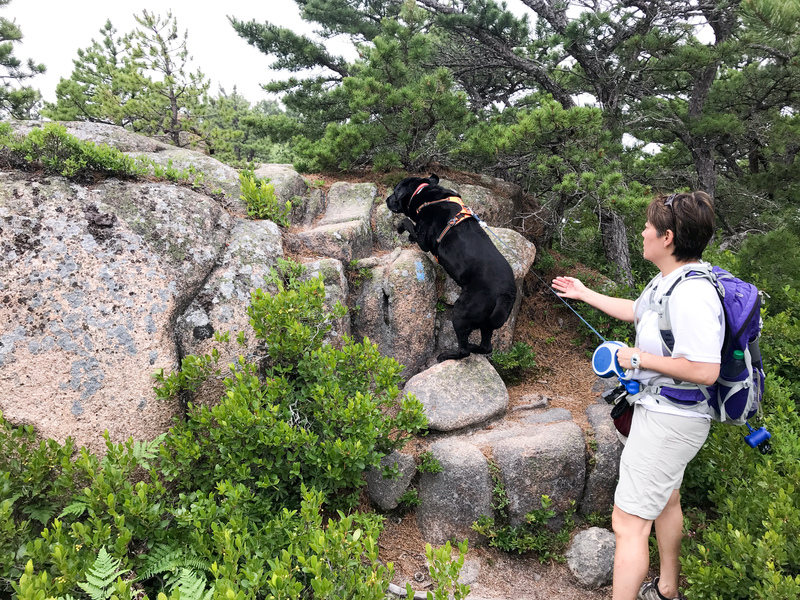 We merged multiple trails to make a nice scenic hike from the bottom of the peninsula at Blueberry Hill up to Schoodic Woods where the campground is located. 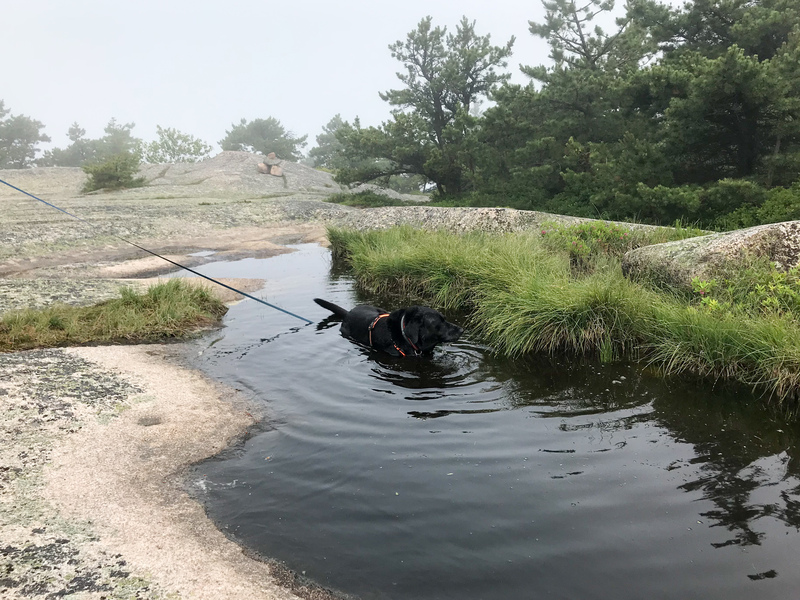 We first drove to the Blueberry Hill parking lot where Opie was able to get a quick soak in the water before starting our hike. 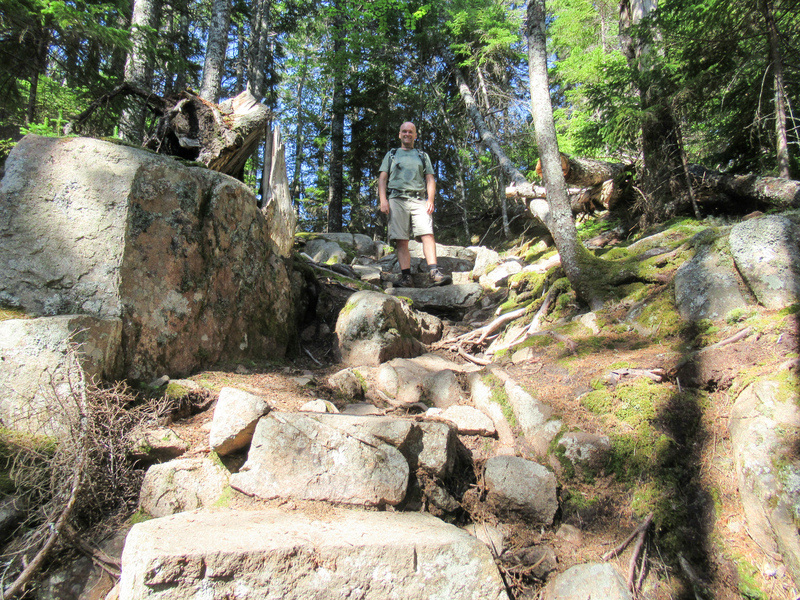 We started on the Anvil Trail which ends at the Schoodic Head summit. From the summit, we took the Buck Cove Mountain trail which crests the summit (at a whopping 224 ft above sea level) and continues all the way back to the campground. This was probably the least crowded hike we’ve done in Acadia. The only people we meet were two park rangers clearing out fallen trees, otherwise we totally owned the rest of the trail with its quiet forest, shade, and peek-a-boo views of the ocean from the top. 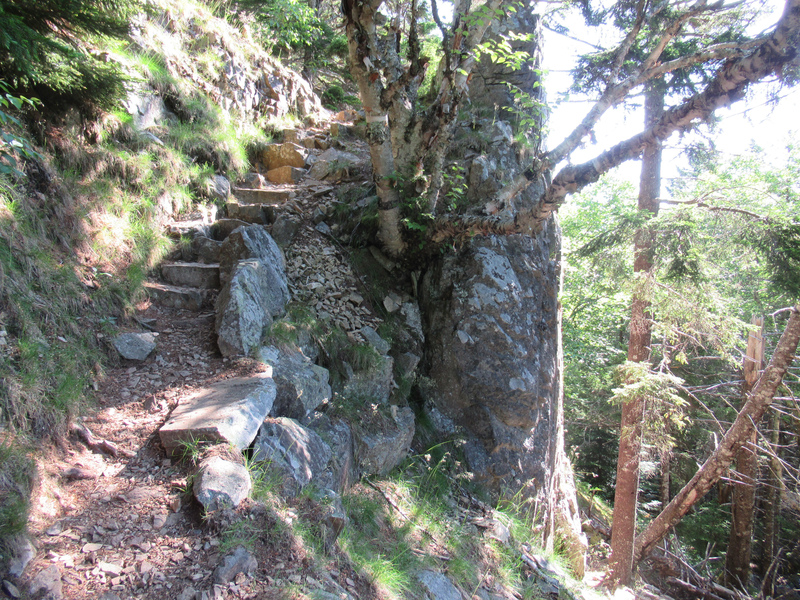 The Anvil trail is probably the hardest part with some steep rock stairs but the rest of the trail is quiet and very relaxing. The entire trail is less than 5 miles and only 800 ft elevation gain. This is definitely a trail that almost any dog could handle. Once we made it to the campground, Mike took the Island bus back to our car to drive it back to the campground. It would have been more convenient if we could take the bus to the trailhead but we hike early and the buses don’t run at that time. However the trail is almost completely shaded, so taking the bus and starting later would be an OK option too. 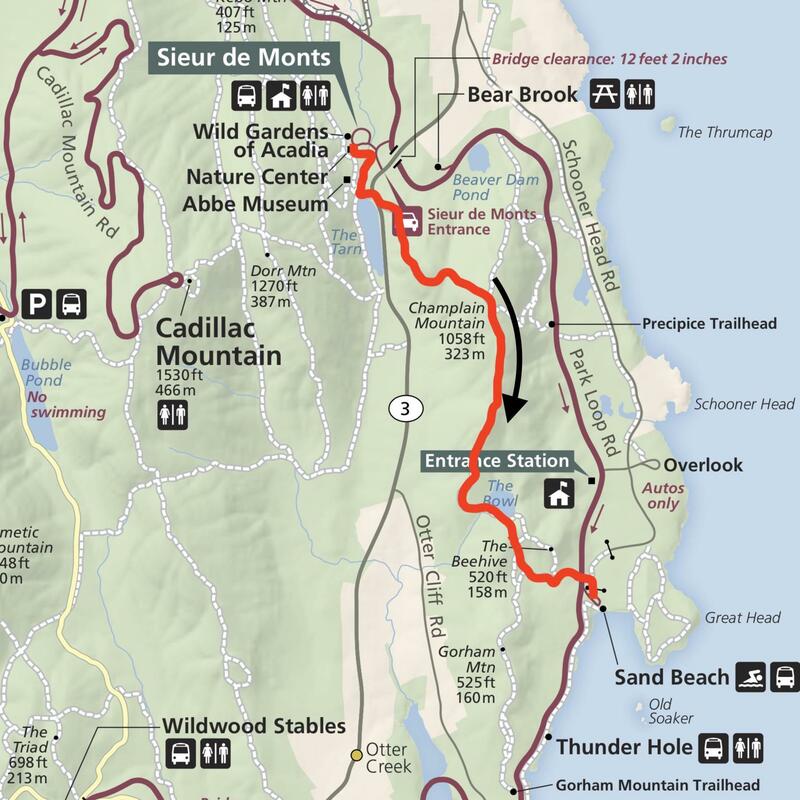 We chose the South to North route since the steepest part of the trail is by Schoodic Head. We prefer climbing up steep areas vs trying to navigate down steep inclines and it’s nicer to tackle the tougher areas earlier in our hikes. 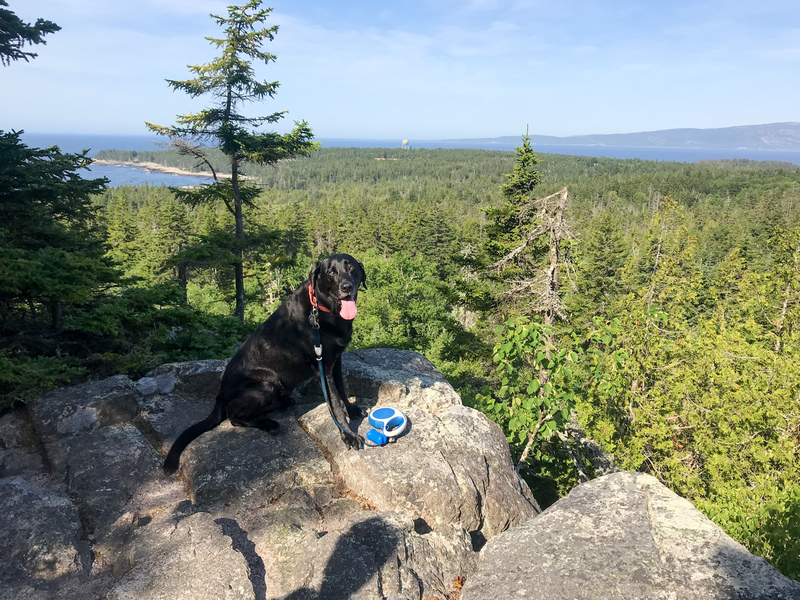 We had hoped to tire Opie out with the various hikes in Acadia but I think we simply built up his endurance. 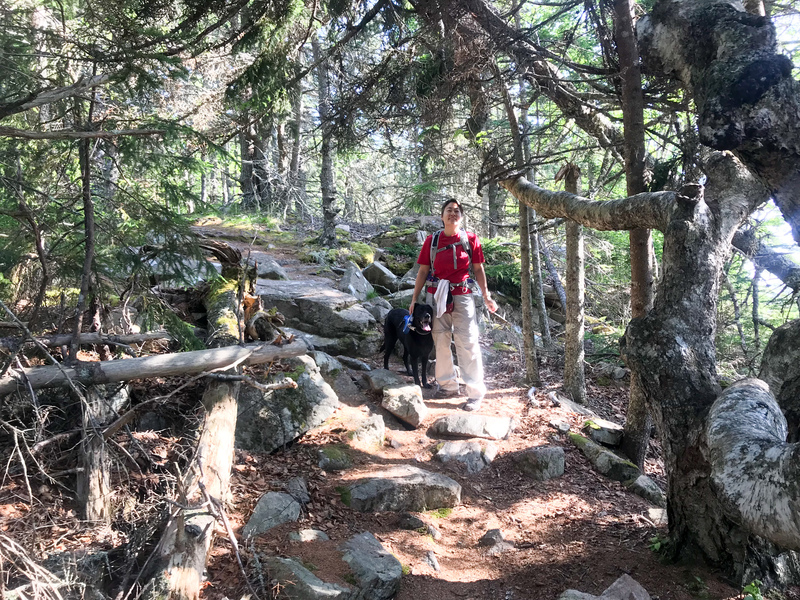 He (and us) loved all the trail options in Acadia and I know we would love to come back and try even more trails. 9 more days and we will be 20 minutes away from Acadia. Thanks so much for the details on the trails, especially from a dog’s point of view. We have 2 dogs that will be hiking with it so the info is so appreciated. Did you try any hikes later in the afternoon? I imagine it is probably packed at that time. I think you two and the dogs will have a blast! I did hear that if you go later in the day (later afternoon/early evening) the trails are also nice and quiet too. We did the Ship Harbor trail around 11am and the parking lot was already full and there were a fair number of folks on the trail but it didn’t feel very crowded. 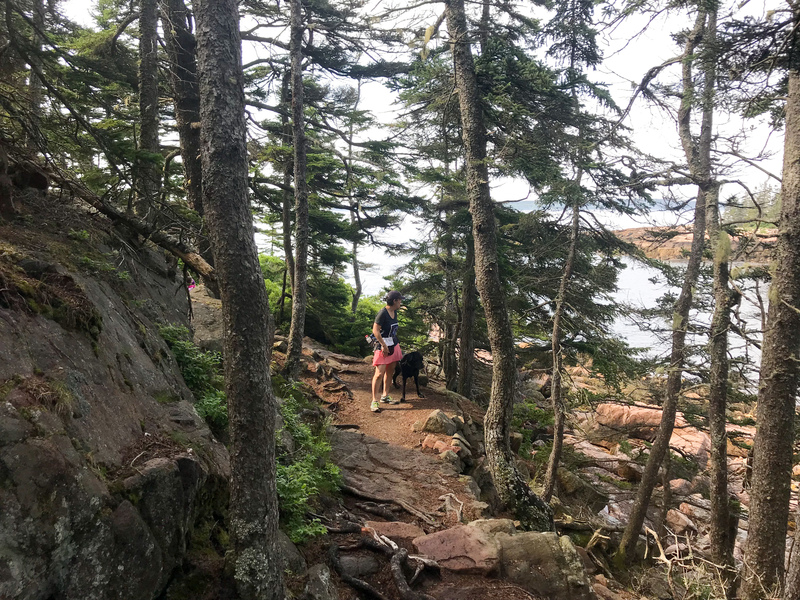 When we drove around Acadia park loop, it was packed with people by 10-11am and by the time we got off Champlain Mountain at 10am, there were a LOT of people headed to Beehive trail. So I’d say best bet is either early morning (8am) or later afternoon (2-3pm). Have a great time!